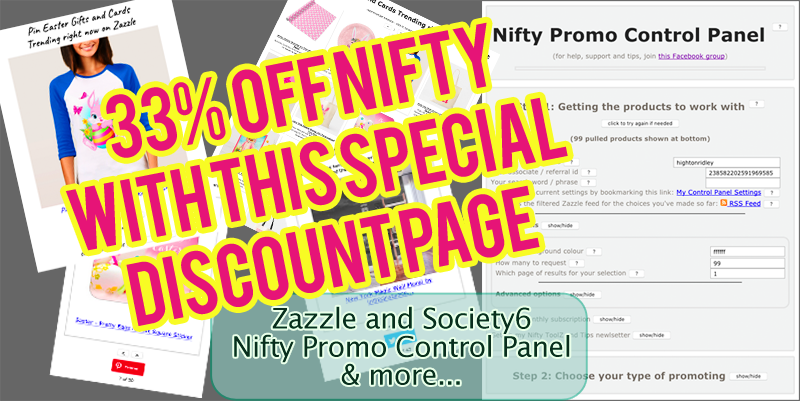 Get Your Nifty Subscription at 1/3rd off normal prices! This is where you buy a monthly subscription for your Nifty membership for a third off the normal price! It’s normally $9 per month with your first 3 months for the price of one. For this special page, you get a whopping 33% discount! That means you pay only $6 for the first 3 months and then only $6 per month after that! Why do we do it this way? It’s because, on average it can take up to 3 months to start getting your first referrals. We want you to keep your costs down as low as possible while you’re starting out. We can’t play fairer than that. Zazzle affiliates. Zazzle changed things starting in April 2019. If you find you’ve been opted out (it’ll only happen once) you’ll need to opt in via your Zazzle account to get your referral id. Society 6 affiliates (aka curators). You have to apply to be a curator on Society6. When you do, you’ll be given your Curator Id. With a membership you always get any affiliate commission due on all the product designs you pin or share. In other words your referral id / curator id is used in all the links. You get up to 25 active (ie switched on) nIFTTTy scheduler applets on IFTTT at any one time, automatically pinning / sharing products for you. After you’ve paid, there’s nothing else for you to do apart from wait for a few hours. As soon as we receive details of your subscription, we’ll add your referral / curator id to our member list. From that point on, all new links generated by any of the Nifty tools will use it – new scheduled pins, existing product grid and slideshow pages (because the links are generated afresh for each visitor) and new manual pins / shares. *If you’ve made any embed-code widgets, these aren’t generated afresh when the page they’re on is visited. So if you have any of those you’ll want to remake them. If you cancel your subscription, your links will still use your codes. *If you cancel your subscription, any existing product grid and slideshow sharer pages you’ve made will revert to 50/50 referral sharing. This happens because they’re generated afresh for each visitor. It’s funny how a membership is also a great motivator if you find it hard to get started promoting. It’s so easy, so fast to use you’ll actually want to!